Following the move by Chiang Kai-shek and the Chinese Nationalist Party Kuomingtang (KMT) to Taiwan after losing the Chinese civil war to the Chinese Communist Party (CCP) in the late 1940s, and Chiang’s subsequent lifelong vow to reclaim the mainland, "China " has occupied—if not monopolized—the gaze of Taiwan, where its projected images are reflected. Whether mirror image, shadow, or ideal contrast, China has been, and will continue to be, a key reference point in Taiwan's convoluted effort to find its identity. Language, Politics and Identity in Taiwan traces the intertwined paths of five sets of names Taiwan has used to name China since the KMT came to Taiwan in 1949: the derogatory "Communist bandits"; the ideologically focused "Chinese Communists"; the seemingly neutral geographical designators "mainland" and "opposite shore/both shores"; and the ethnic and national label "China," with the official designation, "People's Republic of China." 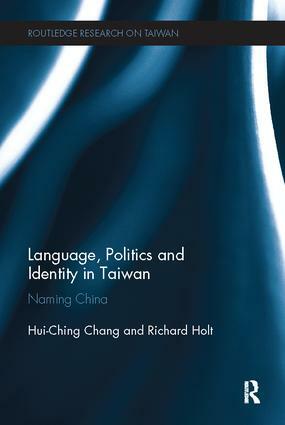 In doing so, it explores how Taiwanese identities are constituted and reconstituted in the shifting and switching of names for China; in the application of these names to alternative domains of Taiwanese life; in the waning or waxing of names following tides of history and polity; and in the increasingly contested meaning of names. Through textual analyses of historical archives and other mediated texts and artifacts, the chapters chart Taiwan's identity negotiation over the past half century and critically evaluate key interconnections between language and politics. This unique book will be of great interest to students and scholars of Taiwan studies, Chinese politics, communication studies and linguistics. China (zhongguo, ୰ᅧ) and the PRC (zhonghuarenmingongheguo, ୰⳹ேẸඹ࿴ᅧ)—“us” or “them”?